I was first diagnosed with diabetes at a young age. I was in my 20s and couldn't believe my doctor when he told me my blood sugar levels were high. But, I had all the risk factors. I was overweight. I never exercised. More importantly, both of my parents and my older sister were diagnosed with diabetes years before I was. I spent the next 10 years of my life ignoring my diagnosis. I ate what I wanted, I didn't watch my weight. Life was for living, I thought, and that meant I got to do what I wanted. After 10 years of ignoring my problem, my blood sugar levels were out of control. I also started to develop complications from the disorder. Among the most unpleasant complications was nerve pain, or diabetic neuropathy. It started with a tingling in my left foot. It got worse from there. Soon, my entire foot felt numb. I began to have pain in other areas of my body, too. There were some days when doing the most basic of things, such as putting on my socks or draping a blanket over my feet at night were too painful. I decided it was time to call my doctor again. He wasn't too happy with me for ignoring my diabetes for so long, but we agreed we would do what we could to slow down the nerve damage and reduce the pain. I got serious about monitoring my blood sugar, started a meal plan and focused on being active. Doing so helped my diabetes, but I was still experiencing pain and occasional number in my feet. The pain was also in my hands from time to time. He reassured me that the antidepressants would help because they would block certain chemicals in my brain that caused me to feel pain. They did that, but they also had so many side effects my life was uncomfortable. I gained weight, I felt dizzy and my mouth was often dry. I told my doctor about the side effects and he recommended switching to an anti-seizure medication. After a lot of trial and error, we found a brand and a dosage that worked. But the side effects ended up being just bad with the anti-seizure pills as they were with the antidepressants. It was then that I decided to do some research on my own. My older sister, also a diabetic, told me she had had some success taking vitamin supplements. She then told me about studies that had tested the effectiveness of B vitamins and alpha-lipoic acid for treating nerve pain. She told me the name of the product she had used and I decided to give it a try. It was Nerve Renew. The product contains several types of B vitamins and a form of alpha-lipoic acid that's more stable and effective than the standard form of ALA. Along with ALA and B vitamins, Nerve Renew contains a variety of herbal extracts, all of which have been shown to help patients with nerve pain. I figured I was willing to try medicines that had awful side effects and that left me feeling not myself. I might as well try Nerve Renew. Am I ever glad I did. Not only did the product help ease the pain I felt in my hands and the tingling in the feet, it got rid of the numbness. Plus, it didn't cause side effects. I've been where you are today. In pain and tired of medications and treatments that work, but at the expense of your quality of life. That's why I created this website. I want others who are dealing with neuropathy and nerve pain to learn about a treatment that can really help them. 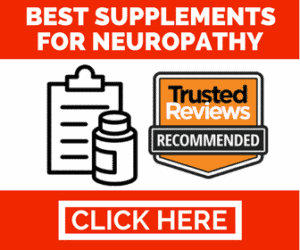 The site contains reviews and comments from actual customers, as well information about neuropathy, its causes and ways to treat it. 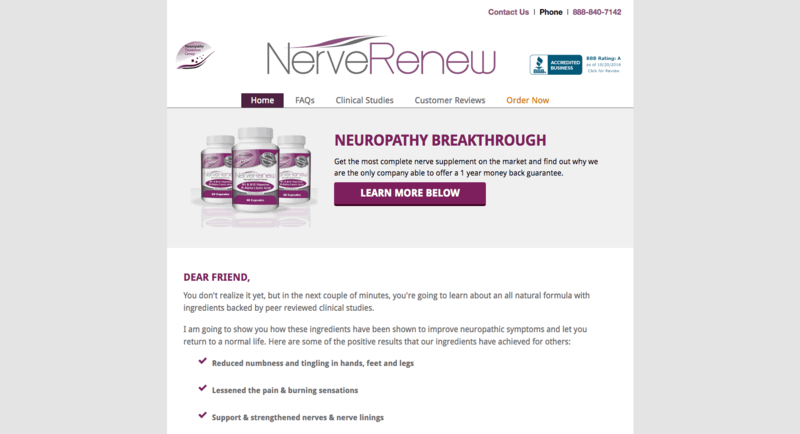 Nerve Renew is produced by the Neuropathy Treatment Group. The company stands behind it product and it proud to be able to produce it right in its hometown of Boise Idaho. Over the past few years, the Neuropathy Treatment Group has reviewed numerous clinical studies that demonstrate the effectiveness of the active ingredients in Nerve Renew. These studies have looked at the effect Methyl B12, found in the product, have on diabetic neuropathy. They've looked at the effect R-ALA has had on various types of neuropathy. There have also been studies looking at the effect of Benfotiamine, the form of vitamin B1 in the product, on neuropathy. Along with reviewing the data, Neuropathy Treatment Group has conducted its surveys. It's asked customers about the results they've gotten from the product. Eighty percent of the 450 people who responded to the survey reported a total or some improvement in their nerve pain symptoms. 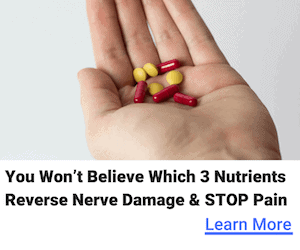 Neuropathy Treatment Group is happy to stand behind its product and it is not a scam. The company offers a 100% money back guarantee. If you feel that Nerve Renew isn't working for you, you have up to a year from your last purchase to request a refund. The company also offers a free trial of the product to people who want to give it a try before purchasing. On this website, I've put together a number of reviews from some customers who have had success with Nerve Renew. I'm one of them, but there are many more. You'll also find answers to frequently asked questions about nerve pain and neuropathy. Neuropathy is a complex issue. Although diabetes is a common cause it, it's not the only cause. I've attempted to answer some of the questions I get asked most often. I've also included a resources page with a lot of organizations out there who are working to come up with a cure for neuropathy or to provide more information to people at it. There are also several support groups for people who are dealing with nerve pain. They are all worth checking out. I hope this site is helpful for you. I've been where you are, and I'm happy to say that nerve pain is, for me, a thing of the past.